In movies, immediately after a mother gives birth, a nurse places a pristine newborn in her arms. In real life, however, babies usually look more Alien 3 than Pampers ad as they enter the world—their heads are misshapen, their faces resemble grumpy old men, and they’re covered in a white film. The traditional protocol has been to get them a sponge bath, stat. But some doctors are now recommending new bathing procedures, and they may be gentler and safer for babies straight out of the birth canal. Here’s what parents need to know. That slick, creamy stuff all over your baby? It’s called vernix, and while it looks messy, it’s a protective layer that helps ward off infection and natural skin moisturizer. At UCHealth, a health system in Colorado, newborn baths are delayed for at least eight hours after birth in most cases. Doctors want to prolong the protective benefits of vernix, and also leave some amniotic fluid on the skin, which can promote better breastfeeding. According to Dr. Christine Gold, a physician at UCHealth, amniotic fluid is similar to colostrum, the initial breast milk that mothers produce. Also, whisking babies away for bath and other non-critical procedures right after they’re born can rob parents of that important “golden hour” of skin-to-skin contact—the time when they can bond and establish a breastfeeding routine. Placing a naked newborn on a parent’s bare chest has been shown to help stabilize the baby’s body temperature, regulate their blood sugar levels and make their transition into the world less stressful. 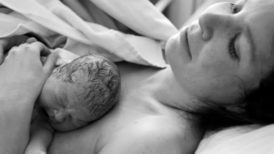 Have your nurses wait to bathe your baby—they might keep bugging you about it (my nurse kept looking at my crusty-haired newborn, asking me, “Are you sure?”), but know that it’s your choice. First, wrap your baby securely in a swaddle cloth with her arms folded up. Fill a tub with water that’s between 100-103 degrees Fahrenheit. Slowly lower your swaddled baby into the tub until the water is at chest and shoulder level. Then, starting with the legs, individually unswaddle each limb, wash it and rinse it. Do everything slowly and gently. Wait at least 24 hours after circumcision to give your baby boy a bath. Newborns don’t need to be bathed every day—once a week is enough. Never put a baby into a tub when the water is still running. Never, ever leave a baby in a bath unsupervised (if the doorbell rings, that person must wait).